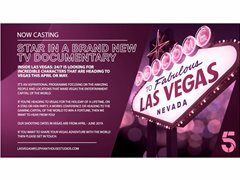 TV & Reality Jobs>Documentary Film Jobs>Are you heading to Las Vegas this Spring? Are you heading to Las Vegas this Spring? Inside Las Vegas: 24/7, for Channel 5, is looking for incredible characters that are heading to Vegas this April or May. It’s an aspirational programme focusing on the amazing people and locations that make Vegas the entertainment capital of the world. If you’re heading to Vegas for the holiday of a lifetime, on a stag or hen party, a works conference or heading to the gaming capital of the world to win a fortune, then we want to hear from you! Our shooting dates in Vegas are from April 8th – June 1st 2019. If you want to share your Vegas adventure with us then please get in touch. We will be shooting in Las Vegas during April and May. No matter who you are or who you're heading to Vegas with, we want to here from you! We're looking for fun tourists who plan on having the holiday of a lifetime in this 24/7 city. You could be a stag or hen group making the most of the final nights of freedom, perhaps a retiring couple planning to push the boat out with your pension or anything else in between. So long as you are fun loving please get in touch!